Thanks very much to my friends who came to support me at my first photo exhibit opening, yesterday at the Blue Bear School of Music open house. Forty of my photos are now on the school's walls, semi-permamently (we will probably swap some out over time). I am very grateful to my music school for giving me this wonderful opportunity to display my work. 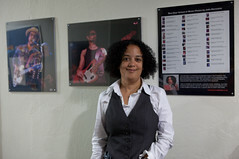 If you missed the opening but would still like to see the photos, drop by Blue Bear at Fort Mason or view them online. I will post more photos from the opening soon.